I worked Saturday at Audubon. Sure sign of Spring #1: Cabin Fever! Little Explorers had 70+ people and the parking lot was full! Later, I decided to take my own private walk with my camera. I went back to the pond where we had seen the mink. By now, the ice that he had bounded over was melted… but I could still hear some commotion under the brush on the island where Mink had found his Mouse. From under the branches came Muskrat. I watched for quite a while as this little critter came up on the bank to trim muddy mustard greens which he then took down to the water to dunk a few times before chowing them down. Back and forth he went until he had eaten most of the greens in that grouping. I followed the path; he followed the edge of the pond beneath shrubs that stood in water because of recent flooding. Then he spotted more greens. I could have stayed out all day… but duties called… Spring is on the way! 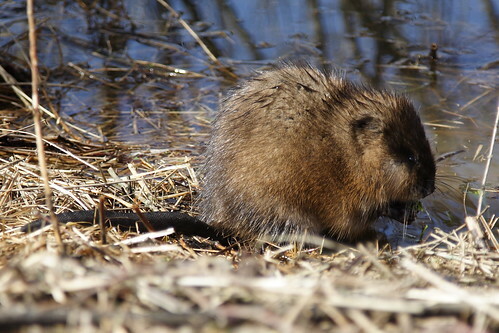 This entry was posted in mammals, spring and tagged muskrat, Ondatra zibethicus. Bookmark the permalink. Great photos of that little guy! I could watch him all day! Great shots of an animal I don’t see too often. Hopefully spring is right around the corner. It was nice to meet you and see that same little muskrat on Saturday. The center is truly an amazing place. I’m sure we’ll be back to visit again. So this is the little guy you’ve been sneaking off on the weekends to see! 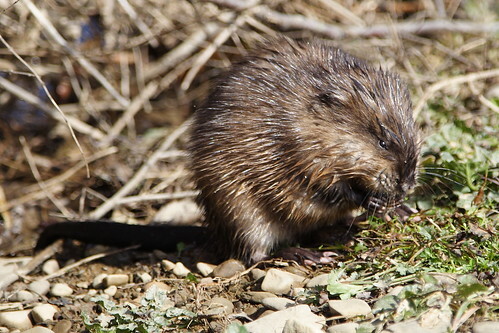 Cute little buggers.I’m not even sure exactly what a muskrat is related to. I’ve seen them occasionally. 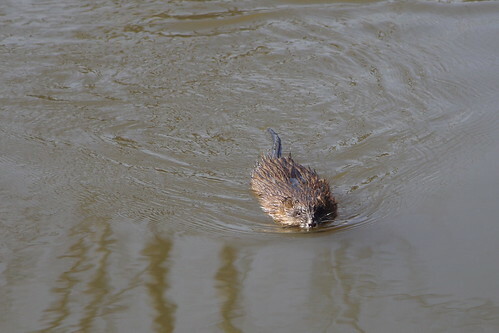 I’m going to do a muskrat google. Hopefully Captain and Tenille don’t come up. They’re cute little critters, aren’t they? I’m so glad you explained this was a muskrat Jennifer. I can imagine my husband and I on that walk, not knowing, asking “Is it an otter, or huge chipmunky creature, did we actually see a larger than life rat!”. It is wonderful to see creatures from other countries, and have them explained. I wonder sometimes, what others make of our Australian platypus!. 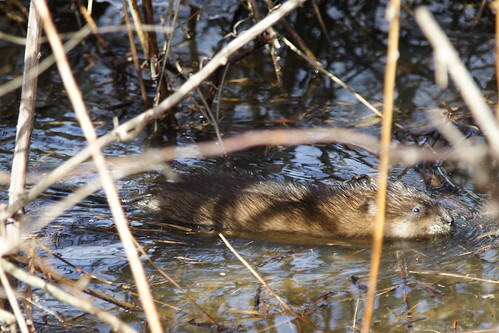 Wonderful photos of your muskrat encounter. I could have watched him all day too.